Henry Campbell Black was born in Ossining, New York (USA) on October 17, 1860. Black became a prolific jurist, writing on many topics. Some of his earlier books were on tax and constitutional law, which Black prepared while based in Washington, D.C.
"A Dictionary of Law : Containing Definitions of the Terms and Phrases of American and English Jurisprudence, Ancient and Modern Including the Principal Terms of International, Constitutional and Commercial Law; With a Collection of Legal Maxims and Numerous Select Titles From the Civil Law And Other Foreign Systems"
"The dictionary now offered ... does not purport to be an epitome or compilation of the body of the law (but) its value is impaired if any single word that may reasonably be sought between its covers is not found there." "The first letter of the English alphabet." Still, the dictionary grew in popularity and with its publication, Henry Campbell Black took on, and went head-to-head with John Bouvier's Law Dictionary which first came out in 1839, but had become a multiple-volume set. A 2nd edition came out in 1910; a 3rd in 1933, 4th in 1955, 5th in 1979, 6th in 1990, 7th in 1999 and since 2004, an 8th edition with a 9th expected in 2009 with the copyright now owned by West Group. In 1917, Black was the editor of the Constitutional Review, a position he held until his death. He died on March 19, 1927. 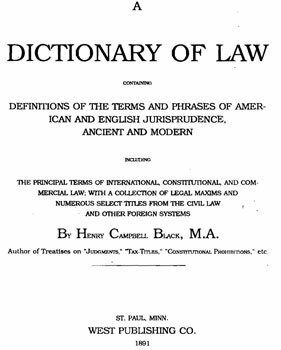 By that time, and still today, Black's Law Dictionary is the most widely-read hard-copy legal dictionary amongst United States jurists.